Tucked in between Rue de Richelieu and le Jardin du Palais Royal, in the Premier Arrondissement of Paris, Rue de Montpensier is short and narrow, little more than a lane, not big enough even to feature on the standard hotel publicity map. In the daytime Rue de Montpensier is thrown into shadow by the tall buildings on either side; little traffic passes on the one-way thoroughfare, just slow cars cruising for a park or cutting into and out of the surrounding main roads; few shoppers pass through the back entrances to the Antiquaires and the chic boutiques which face the colonnades of the Palais Royal on one side and only a few more browse in the basement Art Gallery and the workshop of Couturier, Louise Piquant on the other. The restaurants and bars, if they’re open, do a quiet day-time trade. A steel-shuttered shop-front, some faded signs, dates and inscriptions on buildings hint at the street’s past lives. 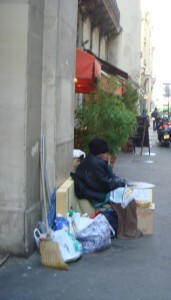 But Rue de Montpensier is not dead. This is the heartland of Paris theatre, with La Comedie Francaise at one end of the street and Le Theatre du Palais Royal at the other. And when the theatres come to life so does Rue de Montpensier. In the late afternoon doors and shutters open on bars and restaurants, waiters in waistcoats and long aprons plant tables and chairs on the pavements, signs light up and blackboards with menus avant et après spectacle come out. In the early evening people begin to trickle into the street, squeezing their cars into improbable spaces, chaining their bikes to unlikely places or clicking sharply on impossible heels over the worn cobble-stones. As the sky begins to fade, doormen in evening dress take a last smoke outside Le Theatre du Palais Royal. Neon letters flick on spelling out the play of the season. Across the road, wedged into the corner next to the arched stone passage through to Rue de Richelieu, the tiny Bar Entre’acte serves aperitifs “avant spectacle” with snacks of bread and goats cheese. Here, thespians sit at tables on the pavement, surrounded by potted geraniums, until the theatre bell calls them to their seats. Just around the corner the restaurant Les Reflets de Scene offers a menu of old French favourites like Salade Lyonnaise, Canard a l’orange, Coquilles St Jacques, Crème Brule and mysterious tartes, at 20 euros for two courses and 25 for three – avant et après spectacle, bien sur! The friendly, funny and helpful waiter Tom will cheerfully guides the confused to a choice of both food and wine. Hidden in the alleys, under the arches and up or down the stairways around Rue de Montpensier, are bars and cafes, just perfect for a post theatre nightcap. 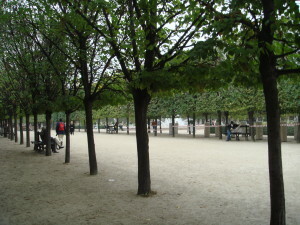 Just opposite the Louvre, are the magnificent buildings and beautiful gardens of Palais Royal. They are steeped in history, whispering with a thousand stories and haunted by hundreds of ghosts. Built in 1624 by the architect Jacques Le Mercier for Cardinal Richelieu, the palace was first known as the Palais du Cardinal. When Richelieu bequeathed it to the Crown, it became the Palis Royal and was in turn home to Louis XIII, the young Louis XIV, the Dukes of Orleans and the seat of the House of Bourbon. In 1784 Louis Phillippe II, Duke of Orleans, opened the palace gardens to the public. The architect Victor Louis restructured the surrounding buildings and enclosed the gardens with colonnades. From the 1780s to the mid-1800s, Palais Royal was a hub of Parisian social activity and political intrigue. Businesses flourished under the colonnades. Cafes sprang up, among them the one where, in July 1789, Camille des Moulins leapt onto a table and exhorted his fellow revolutionaries to take arms and storm the Bastille. Restaurants were established, like Le Grand Vefour, which still operates today as a grand and rather expensive Bar Americain, Bar Anglais, and Brasserie. There were businesses and shops, like the one where Carlotte Corday bought the knife she used to stab Jean Marat. Gambling dens, bordellos and prostitues also plied their trade under the arches. The apartments around Palais Royal, have been home to many famous Francais and Francaises, like the novelist, Colette who lived here in the early 1900s. Palais Royal today houses the offices of the French National Government, the Conseil d’ Etat, the Constitutional Council and the Ministry of Culture. Across its forecourt Daniel Burens 1986 sculpture stretches like a forest of black and white stone stumps, where people sit and rest in the sun while children jump and dance precariously. And every day at 12.00 midday, at Palais Royal, the Noon Canon, set up in 1786, captures the rays of the midday sun, ignites and fires a shot.